Synopsis: Mobster Archie Stryker is brought to the secret headquarters of Project Safeguard in Maryland where he watches surveillance footage of ROM apparently killing policemen, soldiers and innocent bystanders. The Dire Wraiths in their human disguises as the leaders of Project Safeguard offer the criminal the opportunity to fight against ROM in exchange for his freedom. 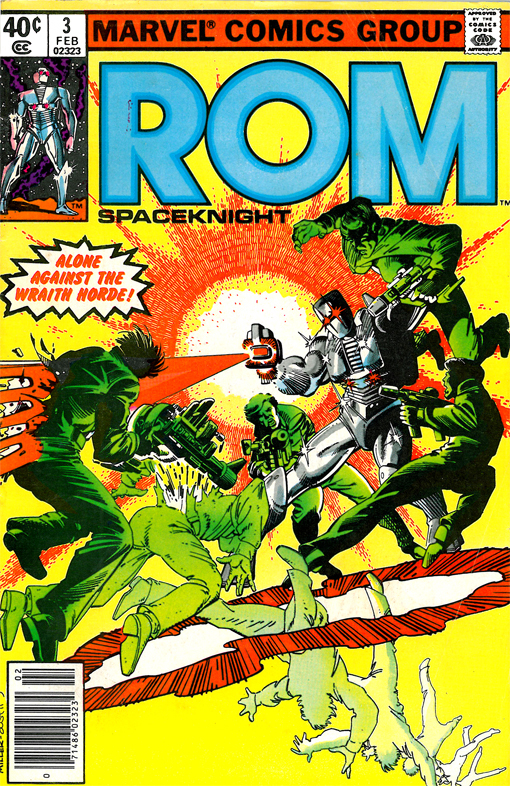 Back in West Virginia, ROM stands on a mountaintop, recalling the circumstances on his home planet of Galador that necessitated his transformation from a man to a Spaceknight in order to fight the Dire Wraiths. ROM mourns the loss of his humanity, a sentiment he seems to feel more and more since meeting Brandy. Elsewhere, Brandy reflects on recent events and agonizes over her belief in ROM and his mission to fight the Dire Wraiths versus the widespread belief that he is an alien monster responsible for murdering innocent people. Arriving home, Brandy finds agents from Project Safeguard waiting for her. At the Project Safeguard base, Stryker is put through the paces of a training exercise and realizes that he will not be capable of fighting ROM without some extra advantage. He is offered a suit of living armor like ROM’s and he reluctantly agrees. In West Virginia, ROM detects alien activity and investigates, finding an underground base where the Dire Wraiths are building a transporter that will allow them to bring their evil forces to earth. Determined to stop their plot, ROM banishes the Wraiths to Limbo and destroys their transporter. As ROM concludes his attack, he is blasted by a force that he recognizes as the sacred Living Fire of Galador, a force controlled by his fellow spaceknight Karas. ROM learns shortly that in place of his old friend, he now faces Archie Stryker reborn as Firefall!